Harajuku girl wearing a pink-and-purple ensemble with platform sandals and a Disney backpack. Twin Japanese teen pop idols wearing matching street styles in Harajuku. Harajuku high school student having fun in Harajuku with her mom, both of them dressed in kawaii colorful street styles. Harajuku trio of girls in colorful mixed prints and vintage items with fuzzy top over heart print top, satin pants & sneakers, ruffle top over sweatshirt, drawstring shorts & sneakers, and houndstooth print shirt, pencil skirt & platform shoes. 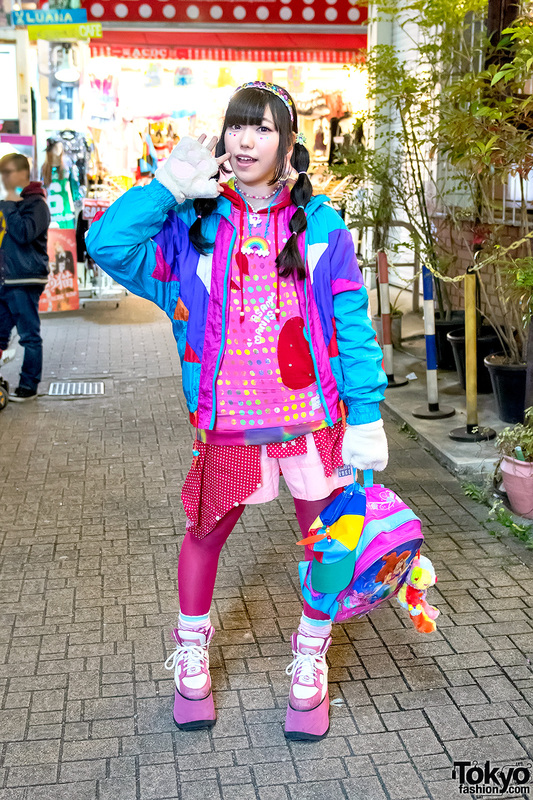 Harajuku girl in twin braids sporting a pink fashion style with ruffle top, skirt, eyelet button down dress, pink knee high socks, platform sandals and a glitter chain bag. Harajuku student wearing a plaid coat over striped sweatshirt, rolled up pants, platform sneakers and a double belt. Harajuku fashion student wearing silver and pink including a sheer top, silver pleated skirt, platform sneakers, Tamagotchi necklace, and Minnie Mouse waist bag. Colorful resale fashion and kawaii accessories on Takeshita Street in Harajuku.